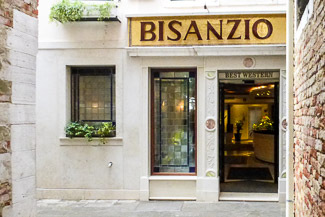 The Hotel Bisanzio is a four-star establishment at the end of a quiet street just off the Riva degli Schiavoni, the waterfront promenade east of the Piazza San Marco that is home to many of Venice's top luxury hotels. The Bisanzio's 44 rooms range from doubles and twins (some with terrace) to family-friendly quads. Wi-Fi is free, and pets are welcome. Walk straight ahead. You'll the Bisanzio facing you at the end of the street.